2-CLIPS peptides are small, highly constrained bicyclic peptides. While they have affinities and specificities comparable to antibodies, they are much smaller in size (1.5–2 kDa) and can be chemically synthesized. Efficient discovery of 2-CLIPS peptide drugs therefore can be performed by direct functional screening of libraries of soluble 2-CLIPS peptides against the target of interest. 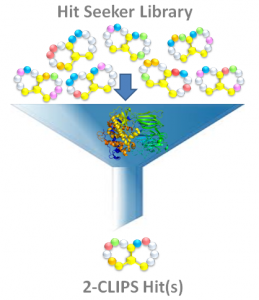 Pepscan has developed a highly efficient process to make large libraries of 2-CLIPS peptides. Furthermore, we demonstrated that through an efficient optimization process, activity in the low or even sub-nanomolar range can be obtained. In order to unlock the full potential of the 2-CLIPS compound class, Pepscan makes Hit Seeker libraries of 2-CLIPS peptides available for screening purposes to third parties. 2-CLIPS libraries can be designed to include pre-defined target-specific structural information or be made fully random. The possibility to include non-natural aminoacids as well provides additional diversity to address different targets. The power of 2-CLIPS peptide screening is demonstrated for the case example below. also applicable for monocyclic ‘1-CLIPS’ Hit Seeker libraries. Depending on your needs and applications, Pepscan is open to various royalty free compensation schemes for supply of 2-CLIPS Hit Seeker libraries. Contact us for more information. Prolylendopeptidase (PREP) is a large cytosolic enzyme that belongs to a distinct class of serine peptidases. The enzyme is involved in the maturation and degradation of peptide hormones and neuropeptides. Human PREP has been evaluated as a pharmacological target for neurological diseases due to its high brain concentration and ability to cleave neuropeptides in vitro. In the FP-7 research project “Neuropro’ Pepscan collaborated with the group of prof. A. Lambuir (University of Antwerp) in the discovery of novel PREP inhibitors, via screening with 2-CLIPS peptides Hit Seeker Library. Out of a library of less than 2500 random 2-CLIPS peptides (5×5 format) screening yielded 2 initial hits with strong PREP inhibitory activity (< 1 uM). By performing 2 rounds of optimization via natural amino acid replacements, and one more round in which also some non-natural amino acids were applied in the replacement analysis, the inhibitory activity had increased more than 500-fold to 1.6 nM. Moreover, the identified 2-CLIPS peptide demonstrated high selectivity towards PREP; no meaningful inhibitory activity was observed for a series of related proteases, such as fibroblast activating protein (FAP) and several dipeptidylpeptidases (DPP-2, DPP-4, DPP-8 and DPP-9). These results demonstrate the power and efficiency of soluble 2-CLIPS peptides libraries for the discovery and optimization of highly active and very selective inhibitors of protein protein interactions.